A new year is upon us; we wish you much success and happiness!!! To celebrate, Trendease is now offering an hour of free consulting to all fully-paid premium content subscribers with each year’s subscription starting with new accounts and renewals in 2014. This can include topics such as which trade shows should you attend to what designs are best for your collection to personal introductions, and everything in between. This issue embraces all that is creative from the independent designers to the large producers. Get inspired with the January edition! Frankfurt — Welcome to 2014! As ever, this month we bring you a truly international look of the design world. We are here to whet your palette just in time for the winter trade show bonanza. There is a perfection found within imperfections. Handmade, thoughtful, and locally produced are key elements found in this issue. On the other hand we see how new readily available technologies affect design. Worldwide — Thank goodness for artisans. The world would miss a great deal of beauty without them. Some of the ceramic designs selected for this gallery are made to order and others are produced on a larger scale. Some of the magnificence is straightforward while others have a more discreet or hidden design. Pearls, cherry blossoms, feathers, death and a higher power are all part of the creativity here. London — While some people may resort to texture for surface interest and visual impact, others opt for pattern, and my, oh, my, there are some amazing patterns to choose from out there! The four companies featured within this gallery all have varying sources of inspiration when it came to developing the striking prints seen here. Aesthetics aside, their business ethic is also admirable. Worldwide — Believe it or not, traveling around the world as often as we do in search of the latest and the greatest can sometimes leave us less than inspired. From time to time we come down with some serious cases of déjà vu. Coming across these designs on our adventures cured us. The clever creations found here within are truly unique and we hope that they bring a touch of awe to your day. Furniture, lighting, air purification, and origami never looked so good. Worldwide — Why take a trip to the museum to view the old masters when the latest bedding, bath, window treatments, and fashions boast a painter’s stroke of genius? Florals with a watercolor-like appearance have been popular the last few seasons. While those continue, we also see the rise of what looks like gloopy oil paints covering the canvas of home fashions. Worldwide — This selection of products scouted at international fairs is rich with emotion from creative humor to documentary-like realism. Aside from the obvious motif and figure use for the products seen within this gallery from around the globe, there also remains deeper meaning. Personalization, or rather mass individualization, and personal connection leaped forth as being themes worth exploring further. Moscow — Italian furniture, English charm, and a hint of shabby chic decorate an apartment from the Stalin era in the heart of Moscow, Russia. Color was utilized to optimize the small space. Light shades of gray clay, wood, banana leaf, and hemp enhance the mood. High ceilings and furniture with storage space built into the alcoves keeps the feeling light and airy. Frankfurt — Messe Frankfurt, Heimtextil, and Zukunftsinstitut recently published a management report on the “Female Shift”. The insights are thought-provoking. In reading this you will learn about the “Everyday Manager”, the home as a control center, how quality trumps price, the lifestyle of “living apart together”, and the general “feminization of society”. Heimtextil 2014/15 Trend: Generate Collision! Frankfurt — “The growing interest in customization continues to stand as a counterpoint to the modern era of mass production.” Personal and interactive is the name of the game when it comes to the putty playground, print potential, and digital body painting in the forum of the Generate Collision trend direction. Plus color, color, and more color--so vibrant that it practically glows in the dark! Heimtextil 2014/15 Trend: Engineer Nature! Frankfurt — Scientific research is merged with artistic visions to breed new materials for design. Biochemical engineering techniques are employed to use cells and bacteria to grow specific dyes and print substrates for textile application. A chair is made from mushrooms! And imagine bacterial cellulose that could be your next sofa’s upholstery. These boundary-pushing advances, located in a sea of the latest textile samples, are only a few of the mind-blowing discoveries to be uncovered in the Heimtextil trend forum. Heimtextil 2014/15 Trend: Exalt Purity! Frankfurt — In the midst of a very busy trade show kicking off the year, Exalt Purity is a refuge from the chaos. Visitors to this area of the trend forum could unplug, relax, and enjoy a cup of complimentary jasmine tea, but not just any cup; each tea flower was hand-sewn together and slowly unwrapped itself in the hot water. This meditative sanctuary and special retreat is welcome in many homes for the 2014/25 seasons and beyond. 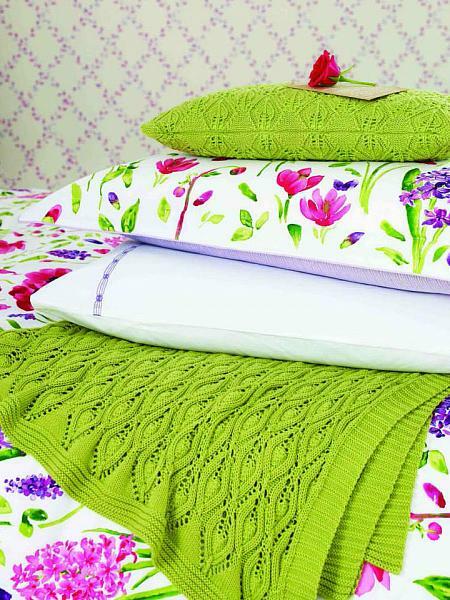 Heimtextil 2014/15 Trend: Rejuvenate Craft! Frankfurt — Rejuvenate Craft includes the pursuit of more meaningful and authentic experiences, and such a genuine experience is possible with a visit to this section of the trend forum. Entering between the colored pillars, like needles holding together a woven fort of the latest textiles, Barn is discovered with a blanket of wood shavings covering his chest, as he is hard at work, living and breathing his craft for all to enjoy. London — on Monday acclaimed interior designer and “Dragon” on the BBC show Dragon’s Den, Kelly Hoppen, has launched her new luxury online store, KellyHoppen.com featuring her self-designed home product range, which includes bedding, decorative cushions, accessories, candles, and gifts. Trendease visited her showroom to preview the collection and now subscribers are welcome to see it in all of its glory. Paris — For the occasion of Paris Deco Off, Masters of Linen presents ‘Linen Lux’ where European linen lights up the streets of Paris. Large lampshades decorated with the latest linen collections swing gently back and forth in the cool winter breeze. Also within this collection of images, subscribers will find more materials as well as information and color palettes with Pantone references for Spring/Summer 2015.